Louise Crooks Equine Canada Certified Competition Coach Specialist (Jump). Fully insured with first aid and CPR. 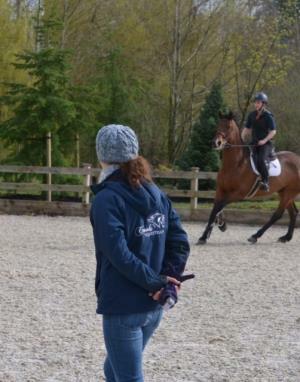 Based in a beautiful private location in the Langley/Aldergrove area, offering indoor and outdoor arenas. Daily turnout . Seasonal daily turnout on grass and excellent all around care. Lovely quiet roads for road hacking. Louise offers instruction for both the competition and the pleasure rider. Specializing in “A” and “B” circuit hunter / jumper shows and also offering instruction for the event rider. Tuition is available for all ages and levels of experience over fences and on the flat. Haul-ins and Clinicians welcome. With over 30 years of experience including extensive competing in the UK in show jumping and eventing where Louise grew up and working on the British show jumping and American 3 day eventing teams, Louise has made Canada her home and invites you to join her and her team, Crooks Equestrian to prepare for the 2016 season ahead.